Um – let me clarify. I’ve been going grey since I was thirteen. What I mean is, when I chose to stop covering my grey with various shades of brown, I thought I’d be mistaken for an old lady. But one mid-week trip to the Royal Academy is a sure bet to make you feel young at heart. If only by comparison. 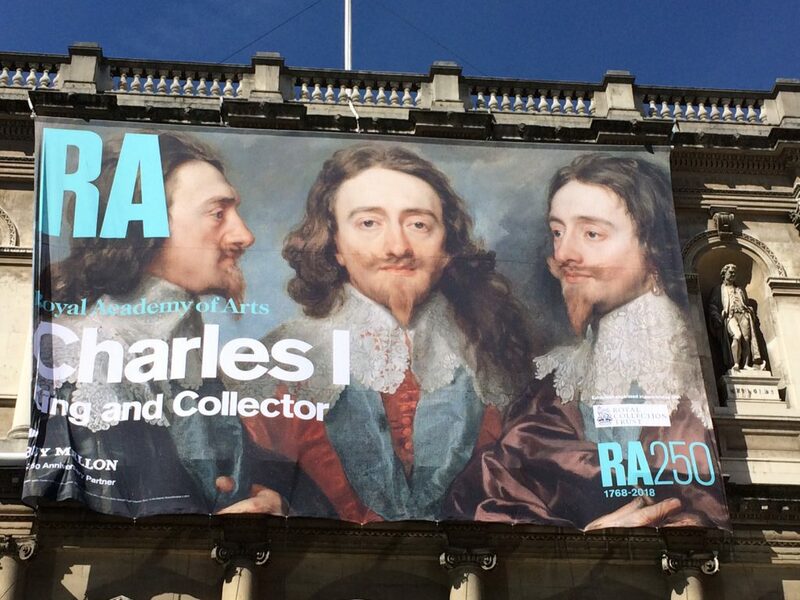 The Charles I exhibition at the Royal Academy is, according to the blurb, the first time the iconic art collection has been reassembled under one roof since it was carved up and sold off by our short-lived republic in the mid-1600s. It is a unique chance to see countless Van Dycks, Rubens, Holbeins and the odd Velasquez and Rembrandt; to appreciate the detail and texture at close quarters of an amazing collection of art. Well, it would be if it wasn’t for the gaggle of old ladies planted in front of each and every painting. Seeing so many of them in one place makes me realise that even if I am, physically speaking, looking older these days, I know that in my heart I am miles away from these old biddies. For one thing, I haven’t perfected the lethal bony elbow for nudging people out of the way when you want to get a better look at Van Dyck’s self-portrait. Luckily Charles I was heavily into enormous portraits of himself befitting his God-given status, and most of them are best viewed from a distance, and I’m still tall enough to view them over the combined mop of grey heads. But my feet, unfortunately, are still at ground level and not quite as lucky – especially when those with no spatial awareness decide to use their seriously deficient reversing skills to step on my toes with their sensible shoes. Alongside some incredible allegorical art by Rubens, I was equally amazed at the seriously wicked glances given by the tiny old people to anything shorter than themselves – people in wheelchairs, children, and the like. I haven’t reached that milestone of intollerance just yet. And I know for sure that after gazing at Velasquez portrait of Philip IV Of Spain, I was probably the only person in the gallery inwardly humming Everything Everything’s Hapsburg Lippp. Yeah – still worlds apart! Back to the art then. My favourites include the Bronzino’s Portrait of a Woman in Green – the lovely direct gaze of a women probably not noted for her beauty, but the artist has captured a wonderfully kind and wistful expression; Van Dyck’s three-way police mugshot of Charles I (possibly predicting Charles’s future run-in with the authorities), and the lovely chalk portrait of Anne Cresacre by Hans Holbein the Younger. I overheard one old lady in front of this portrait point out rather begrudgingly, ‘He is quite good, isn’t he?’ Major understatement! And of course, there are the exquisite miniatures, and here I had to implement my own bony elbows in order to get a look-in. As always, I find lots of thought-provoking questions come up during these exhibitions that need further research. Like, in Van Dyck’s portrait of Queen Henrietta Maria and Sir Jeffrey Hudson, I’m wondering – I think I’d like to know a bit more about the child-like Sir Jeffrey. And why, if the collection was so widely dispersed during the civil war, then how does HM the Queen seem to own the majority of the paintings on display. How did they fall back into Royal ownership after the restoration? What exactly is a Hapsburg Lip?